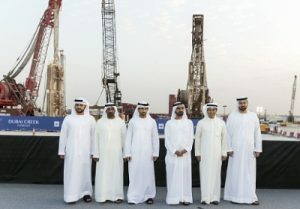 HH Sheikh Mohammed bin Rashid Al Maktoum, UAE Vice President and Prime Minister and Ruler of Dubai, today marked the groundbreaking of The Tower at Dubai Creek Harbour, which will be the world’s tallest tower when completed in 2020. The groundbreaking was held in the presence of HE Mohammad Al Gergawi, Chairman of Dubai Holding, Mohamed Alabbar, Chairman of Emaar Properties, and other dignitaries. Providing stunning 360 degree views of the city and beyond, the Tower strengthens the UAE’s reputation for innovation in architecture, engineering and construction, and will eclipse Burj Khalifa as the tallest building. Re-defining the spectacular skyline and setting a new global referral point, The Tower anchors the 6 sq km Dubai Creek Harbour, one of the world’s largest master-planned developments and a next-generation smart hub defined by the latest developments in artificial intelligence. A JV between Emaar and Dubai Holding, Dubai Creek Harbour is in close proximity to the Ras Al Khor National Wildlife Sanctuary, protected under the UNESCO Ramsar Convention, and the Dubai International Airport. The Tower is designed by Spanish/Swiss architect Santiago Calatrava Valls. 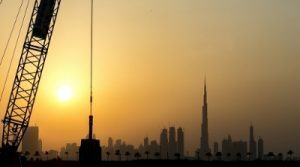 With no similar super-tall structures in the world, Emaar adopts a new approach to building The Tower. Wind-engineering and seismic tests have been completed. Every aspect is designed to the highest international standards – from the materials to the construction technology. The crowning glory of The Tower is The Pinnacle Room in addition to several VIP Observation Garden Decks. It will have dynamic illumination making it a stunning visual landmark during the day and night.